^ Japan Atlas: Japan Marine Science and Technology Center. [4 July 2007]. Barkley, Richard A. Oceanographic Atlas of the Pacific Ocean. Honolulu: University of Hawaii Press. 1968. Blue Horizons: Paradise Isles of the Pacific. Washington, D.C.: National Geographic Society. 1985. ISBN 978-0-87044-544-6. Cameron, Ian. Lost Paradise: The Exploration of the Pacific. Topsfield, Mass. : Salem House. 1987. ISBN 978-0-88162-275-1. Couper, A. D. (ed.). Development and Social Change in the Pacific Islands. London: Routledge. 1989. ISBN 978-0-415-00917-1. Gilbert, John. Charting the Vast Pacific. London: Aldus. 1971. ISBN 978-0-490-00226-5. Lower, J. Arthur. Ocean of Destiny: A Concise History of the North Pacific, 1500-1978. Vancouver: University of British Columbia Press. 1978. ISBN 978-0-7748-0101-0. Soule, Gardner. The Greatest Depths: Probing the Seas to 20,000 Feet and Below. Philadelphia: Macrae Smith. 1970. ISBN 978-0-8255-8350-6. Spate, O. H. K. Paradise Found and Lost. Minneapolis: University of Minnesota Press. 1988. ISBN 978-0-8166-1715-9. Terrell, John. 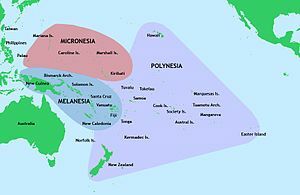 Prehistory in the Pacific Islands: A Study of Variation in Language, Customs, and Human Biology. Cambridge: Cambridge University Press. 1986. ISBN 978-0-521-30604-1.